Located on the Rocky Mountain Front, Choteau is a charming community with a quaint downtown and locally owned shops. 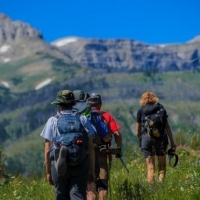 Located nearby are trails to the Lewis and Clark National Forest and Bob Marshall Wilderness. The community is also a launching point for nearby outdoor recreational activities, including skiing, hiking and mountain biking. Choteau is a popular stop on the Montana Dinosaur Trail and the local museum highlights discoveries from the Two Medicine Formation.